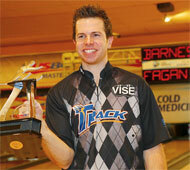 29th January, Las Vegas: Three-time PBA Tour winner, Mike Fagan captured his first major title after defeating top-seed, Chris Barnes, 246-213 to win the USBC Masters 2012 at Sunset Station and Casino Strike Zone Bowling Center. PBA pro, Fagan of Dallas, Texas fought on galantly to overcome a 30-pin deficit in the second half of the title match to upset top-seed, Barnes to pocket the top prize of US$50,000. Fagan failed to strike in his first four frames of the championship match while Barnes started off with four strikes in his first five frames. Fagan then struck seven times to set course for the victory. "All week long I really wasn't thinking about majors, matches or what my opponentn were doing," said the newly-crowned champion. "I just wanted to do my best. Now the fact that it has paid off, it's an amazing feeling. Barnes was hoping to become the third player in PBA history to complete the career Grand Slam with victories at each of the PBA's four majors (PBA World Championship, US Open, PBA Tournament of Champions and the USBC Masters). "This one hurts, it was a difficult day," said Barnes disappointingly, who has now lost the Masters three times as top-seed. "I was mover nervous today for the final than I have been in a long time. Fagan advance to the championship match by ousting 2003 Masters champion, Bryon Smith of Roseburg, Ore., 228-180. In the opening match, Smith came from behind to beat Dan MacLelland of Canada, 251-212 to face Fagan. Barnes received US$25,000 as runner-up for the third time while Smith won US$15,000 for third place and MacLelland settled for US$10,000 for fourth place. The USBC Masters was the tenth event of the 2011-2012 PBA season and the second stop for this year's WTBA World Bowling Tour. The tournament attracted 305 of the best players in the world in the US$235,000 tournament.